Dr Bob Johnson – using social delight to defeat social harm – for all. I’ve just completed a key note speech to a conference in Copenhagen, which was well received. It draws together many of the threads I have been pursuing for 60 years. SUMMARY of The Scientific Evidence That ‘Intent’ Is Vital For Healthcare. To secure a revolution in psychiatry, we need to revolutionise Quantum Science. The next revolution in psychiatry turns on frontal lobe ischaemia. Psychiatry will become much more obvious – physiotherapists are accepted as ‘normal’ for physical ‘strokes’, and in exactly the same way ‘verbal physiotherapy’ will prevail in all mental healthcare – because it works. And it works across the psychiatric gamut – from ‘psychopathy’, psychotic symptoms, and everything else. It all revolves around the Uncertainty of electrons – it’s through these electronic lacunae that we can weave ‘intent’ – at least that’s what I’ve been doing since July 1960. 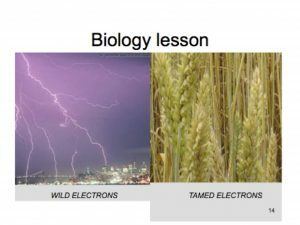 I divide electrons into two groups – ‘wild’ and ‘tamed’, random or organised, as in lightning or wheat. The simple SCIENTIFIC fact is that living photosynthesis tames photo-electrons, corralling solar energy into food, without which we’d starve. It’s really a case of scientific orthodoxy catching up with what happens on the farm – if Quantum Mechanics prevailed 100%, all the time, then our very food supply would also be equally Uncertain, and we wouldn’t be. It’s high time we allowed this ‘reality’ to prevail in the clinic. Empowering ‘intent’ runs counter to the prevailing scientific ethos, so no wonder my researches have drowned. Time for regime change – tee hee. Taming electrons allows frontal lobes to plan ahead, ‘intentionally.’ When frontal lobes go ‘off-line’, as if the sufferer were having a stroke, then restoring cerebral health works on the same, SCIENTIFIC, principle as it does with ordinary conventional ‘strokes’. Vigorous, confident, consensual input by physical physiotherapists is rewarded by stroke victims, who start walking when they never thought they’d walk again. Exactly the same happens with ‘verbal physiotherapy’ with trauma/terror induced frontal ischaemia – same principles, same requirements, even better results, even with psychotic symptoms. Without this, we all remain victims of childhood terror.